Thank you for joining me as we count down to the next MFT release. We are two days away from the big day! All the new Stamps, Die-namics, and Stencils will be available on Tuesday, January 5 at 10:00 pm EST. Be sure to check out the MFT Blog to see all the new items being revealed today. Don't forget to leave a comment on the MFT Blog countdown posts, YOU could win one of the five $75.00 gift vouchers. 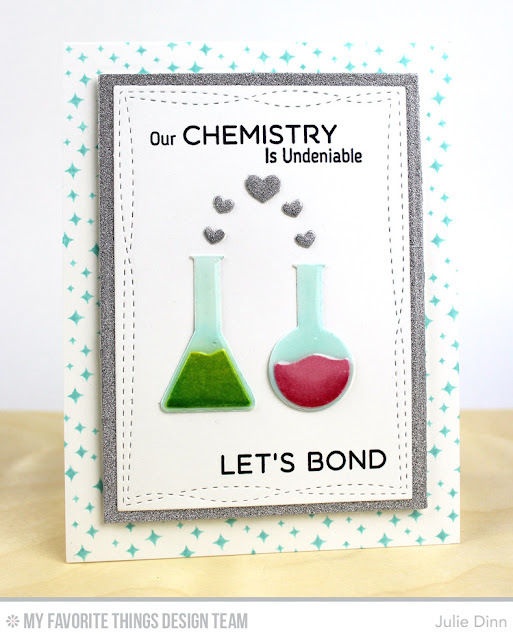 I have a sweet and simple card to share with you today, it features my absolute favourite stamp set and dies from this release, the Undeniable Chemistry stamp set and Chemistry Die-namics. These sets are seriously fantastic! Not only are all the images and sentiments fabulous, the set also contains some amazing little background images. I used one of them on this card to create the background. I die-cut the flasks in Smooth White card stock and I coloured them with Copics. I added a thick layer of Glossy Accents over the flasks to give them the glass look. The hearts were die-cut from the Silver Sparkle card stock. The sentiments were stamped with Black Licorice Hybrid Ink on a Wonky Stitched Rectangle. Julie, I totally agree with you...this set is seriously fantastic! I love how you used this set to make an awesome card. super cute Julie! Love the touch of glitter and the wonky stitched rectangles. I am totally in love with this stamp set! Love your card. Thanks for sharing.